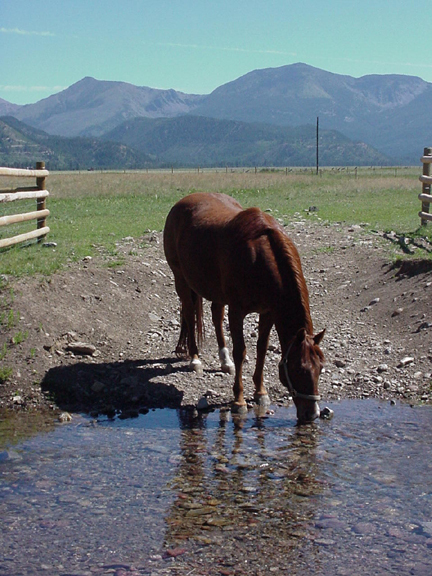 Until she was eight years old, Lena was a perfectly “normal” registered Quarter Horse mare, serving as someone’s riding horse. Then one day, her owner decided Lena had a problem that needed correcting. We wonder if the problem — a tendency to rear up — was actually caused by an inexperienced rider constantly pulling too hard on the reins, and the horse was reacting to poor riding skills. But whatever the case, the horse got the “training,” not the rider. From what we could piece together, the training consisted of tying Lena’s reins tightly behind the saddle, and if she reared up, she’d go over backwards. This would teach her not to do it again. That was the “lesson.” (No, it doesn’t make any sense to us, either.) The trainer hired to teach Lena her lesson did this to her not once, not twice, but four times?and each time she went over backwards, landing on her head and back. The repeated blows to her head ruined her optic nerve. She is now totally and permanently blind. 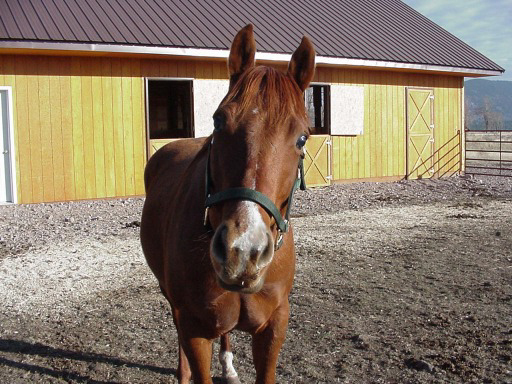 As an 8-year old blind mare, Lena was no longer considered worth much, except maybe for breeding purposes. Blind horses also end up at the bottom of the pecking order in the herd?pushed away from food and water, picked on, always in danger of getting bitten or kicked. Her owner tried to sell Lena, but found no one willing to pay the asking price. 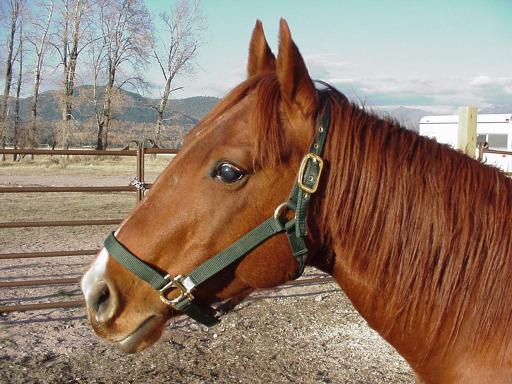 She contemplated selling her to the “canner,” the slaughterhouses where so many horses end up. It was at this point that a friend of the owner’s, seeing the pitiful condition Lena was in and her bleak future, intervened. The friend couldn’t afford to buy Lena, but she offered to breed her, give the owner the foal, and keep Lena in exchange. The owner agreed. So Lena was bred and successfully delivered a foal, securing her freedom. But the owner’s friend realized she couldn’t afford to keep Lena permanently. So when she heard about our sanctuary, a match was made. Lena is a sweet, trusting, gentle soul. She will let us lead her anywhere, walking side by side, step by step. We always talk to her so she knows where we are. She is remarkably calm and “centered” for an animal with no eyesight. Because she can’t see anything, she depends so much on her hearing to know what’s happening around her. Lena’s typical expression is with her head slightly tilted to one side, ears forward, using her hearing to find out who’s nearby. When she first arrived, Lena had a lot of fresh scabs and old scars from the bites inflicted by other horses. She was naturally nervous about her new surroundings and what fate might await her here. Today, the scabs are all gone, some of the scars are beginning to fade, and she has a new confidence that comes from knowing she is home and she is safe.